Welcome to this page on setting your numbers and opening your cell phone and what to look for when you come to connect every thing up. 1). Now you have all the things you need to modify your cell phone first we will need to load the mobile number in to the phone make sure you have the ringer set to silent all so one touch answer turned off and one touch dial or speed dial turned on. 2). It would be best to send the signal to a mobile phone when activated as they have caller display on them now how this works is when the alarm system is activated it will turn on the relay and phone the number locked in the Sim card. 3). Now say if you put your own mobile phone number in number 5 and connected the wire coming from the relay to number five on the circuit board then this will call your mobile phone. 4). I know most Sim cards will work fine around the world if you can program different numbers in to your phone say from 2 to 9 and have speed dialing or one touch dialing set then this will work fine for you . Please also note if you buy a one touch phone/speed dial phone in your own country then this will work fine if you travel out side your own country then it would be best to get a try band phone. Here is some information to let you see why it is best to get the mobile phone in your own country: GSM frequency bands in different parts of the world. 5). Now I will open my own cell phone after you have opened yours and taken out the screws you may see some thing like this as you can see from the photo below all phones have copper pads this is where we will solder our two wires from the relay if you have loaded your own mobile number in all from 2 to 9 then any one pads will allow you two connect the wire from number 2,3,4,5,6,7,8,9 pads. In the photo above you can see how the phone buttons work the white plastic card is covered with silver buttons this is carbon and is what makes the connection to the pads to put the numbers on your screen we don't need this now. 6). Now you will need to tin the two wires before you solder them to the circuit board to do this take off the cover from the wires and very careful solder the two wires this is called tinning we do this so it is much easer to put the two wires on the pads. The wire in the photo above has been tined and cut short as I used wire with red and black there is no need to do this speaker wire will work fine. 7). Now look at the pads you have an inside pad and outside pad solder one wire to the inside pad be careful the inside pad does not touch the out side pad and VS or you will get a short and you will need to use cleaning tools to try and fix it. .
8). 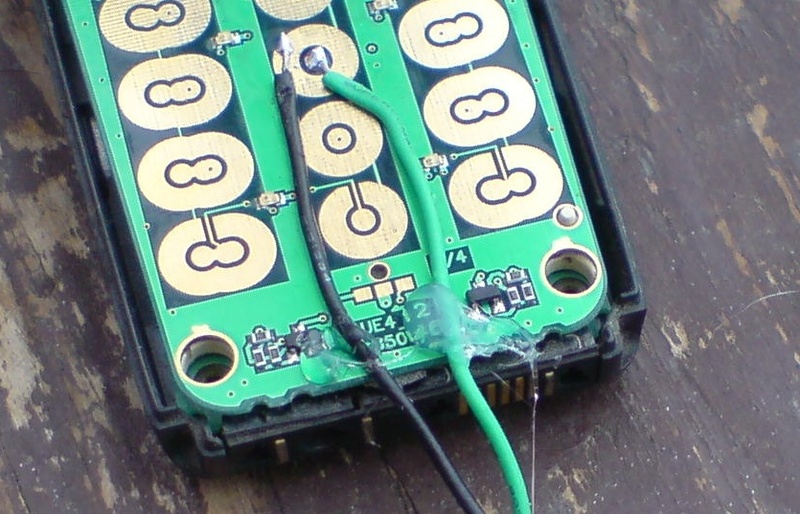 Now when you come to fix your wires to the pad put one wire in side the pad and using your soldering Iron push down on the wire this will heat the solder so it fixes to the pad do the same with the next bit of wire but connect this to the outside pad. In the photo above you can see I have soldered the two wires to the in & out side pads of the modified phone in the photo above I used my Nokia phone as this was a better photo than the one I used before. You may also want to add a little bit of hot melt glue to the bottom of the wires to take some of the stress from the solder contacts see photo below. Any phone with touch button and one touch dial/speed dial will work. 9). Now you will need to add some PVC tape over the pads like in the photo below. Why we need to add some PVC tape over the pad is to help protect the wires. If the case does not fit put some PVC tape around it. Now to go back to the Projects page click here.